The mural celebrates the film and television industry through an exuberant juxtaposition of colors, shapes, and familiar imagery. Stephen Johnson's design commemorates the birthplace of 'the industry' noting the 1915 dedication of Carl Laemmle's Universal Film Manufacturing Company in the area. In abstracted but recognizable forms, the design incorporates many familiar shapes and images associated with the making of and viewing movies such as the classic movie camera, spotlights, stage lights and star motifs. In addition, it includes the iconic popcorn, synonymous with the movie theater experience as well as french fries, relating to Universal City Walk and its restaurants. Musical notes and colorful rhythms in the general design reflect the importance of sound ranging from the spoken word to full orchestral scores. 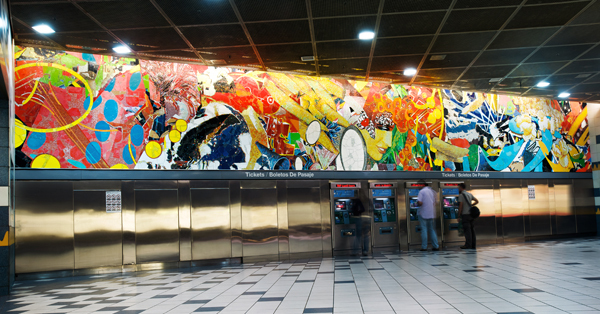 Made of smalti and cake glass, the 58-foot long mural installed above the ticket vending machines at the main mezzanine wall was created by the artisans at Franz Mayer of Munich in Germany. As people pass by or look up while purchasing their tickets, Johnson hopes, "they will find themselves transported, if only briefly into the rich realm of their imagination. After all, Los Angeles is the city of dreams and possibilities." STEPHEN JOHNSON was born in Madison Wisconsin. He studied at The University de Bordeaux, the Conservatoire des Beaux-Arts, Bordeaux, France, received a BFA in Painting and a BFA in Design and Illustration at the University of Kansas. He holds four medals from the Society of Illustrators Museum in NYC. In 2004 he won the Phoenix Award for Exceptional Artistic Achievement and in 2005 he was awarded the Governor's Award for Individual Artist. Johnson's drawings and paintings are found in numerous private and permanent collections, including the National Portrait Gallery at the Smithsonian Institution in Washington, D.C. and the New Britain Museum of Art, Connecticut. Solo exhibitions of his work have been featured at the Memorial Art Gallery at the University of Rochester, New York; the Katonah Museum of Art, New York; and the Spencer Museum of Art at the University of Kansas. Among his public art works is a mosaic mural at the DeKalb Avenue subway station in Brooklyn, New York.